We could not fulfill our mission to improve, preserve, and promote the natural, recreational, and cultural resources of the Sand Creek Regional Greenway corridor without supporters like you! Below are several ways you can support SCRGP. You can also always mail a check to 7350 E. 29th Ave, Suite 300, Denver, CO 80238 or make a donation here. 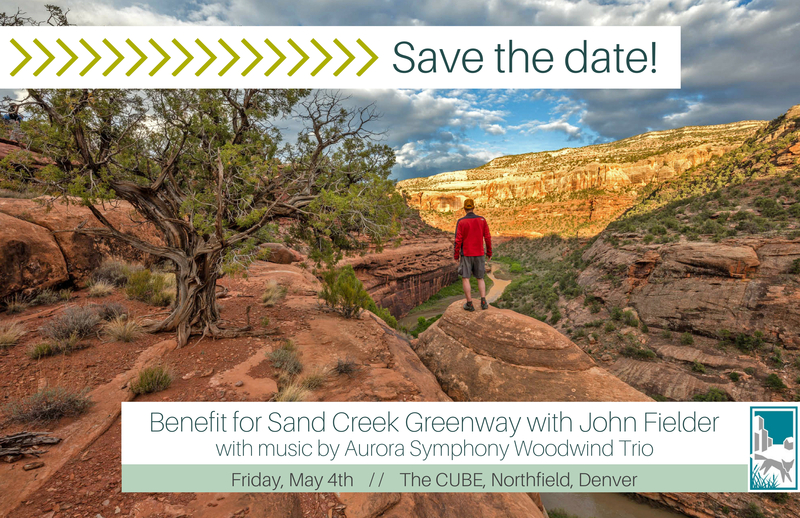 Please join us on May 4 for an “Evening with John Fielder,” a fundraiser for our Sand Creek Regional Greenway Partnership. The evening includes Fielder book sales and signing, a performance by the Aurora Symphony Woodwind Trio, silent auction, hors d’ouevres and drinks. Tickets are $25 and are available online through Eventbrite. Our Signature Sponsor for this event is Suncor. ColoradoGives.org is a year-round, online giving website featuring more than 1,800 Colorado nonprofit organizations, including the Sand Creek Regional Greenway Partnership! Each December, ColoradoGives.org organizes Colorado Gives Day, an annual statewide movement to celebrate and increase philanthropy in Colorado through online giving. Fortunately, you don’t have to wait until December to make a donation. ColoradoGives.org’s donation platform is open year round! Visit coloradogives.org and make a donation to SCRGP today! Made possible by the Community First Foundation, ColoradoGives.org encourages charitable giving by providing comprehensive, objective and up-to-date information about Colorado nonprofits and an easy way to support them online. Community First Foundation’s tax ID is 51-0157964. All of the charities on ColoradoGives.org are recognized by the Internal Revenue Service and the Secretary of State and are in good standing. Donations are tax deductible as charitable contributions to the full extent permitted by law. Planning to shop on Amazon? Shop on smile.amazon.com and choose the Sand Creek Regional Greenway Partnership as your recipient organization. SCRGP will receive 0.5% of qualifying purchases! AmazonSmile is a simple and automatic way for you to support your favorite charitable organization at no cost to you. When you shop at smile.amazon.com, you’ll find the exact same low prices, vast selection and convenient shopping experience as Amazon.com, with the added bonus that Amazon will donate a portion of the purchase price to your favorite charitable organization. Shop through iGive (most major stores and online companies are represented) and a portion of your purchase will be donated to the Sand Creek Regional Greenway Partnership! Sign up for free on igive.com and click on the link for the store where you would like to shop. You will be redirected to the store’s online site, the amount of your purchase will be reported back to iGive, and a portion will be distributed to SCRGP! Online since 1997, iGive.com is the Internet’s first shopping mall where purchases benefit the shopper’s favorite causes. To date, iGive.com shoppers have raised over $8,441,035.30. The Sand Creek Regional Greenway Partnership is a registered 501 (c)(3) nonprofit organization, and your donation may be tax deductible.